This figure illustrates in a schematic way what goes on in a leaf through the processes of photosynthesis and respiration. Photosynthesis is the combination of carbon dioxide and water, with solar energy, to create carbohydrates, giving off oxygen to the atmosphere as a by-product. The carbohydrates are used during respiration, which is the reverse chemical reaction, to produce energy that the plant needs to grow. During respiration, carbon dioxide is released back into the atmosphere, but this is roughly half of what is taken up from the atmosphere in photosynthesis. Similarly, more oxygen is given off during photosynthesis than is used up in respiration. This process takes places in the chloroplasts located in the interiors of leaves. Here, chlorophyll absorbs solar energy in the red and blue parts of the spectrum. This energy is then used to split a water molecule into hydrogen and oxygen; in the process, the plants gain chemical energy that is used in a companion process that converts carbon dioxide into carbohydrates represented by C6H12O6 in the above equation. Click on the images above to see a full size image and complete sources information. The rate of consumption of CO2 by photosynthesis is mainly a function of water availability, temperature, the concentration of CO2 in the atmosphere, and key nutrients such as nitrogen. The importance of water in plant growth is obvious from looking at the equation above. Temperature is an important factor in many life processes, and photosynthesis is no exception. As a general rule, the rates of most metabolic processes increase with temperature, but there is usually an upper limit where the high temperatures begin to destroy important enzymes, or otherwise inhibit life functions. The fact that photosynthesis depends on the concentration of CO2 is not obvious, but it is very important. Plants take in their CO2 through small openings about 10 microns in diameter called stomata, which the plant can control like valves, opening and closing to adjust the rate of transfer. 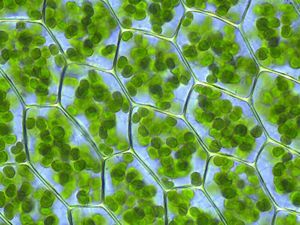 The more they let in, the faster the rate of photosynthesis and the faster the growth — but if they open their stomata wide to let in a lot of CO2, they can lose a lot of water, which is not so good. However, if there is a greater concentration of CO2 in the atmosphere, then the plants will get a good dose of CO2 by opening their stomata just a little bit, allowing them to conserve water. What this amounts to is increased efficiency of growth at higher levels of CO2. We call this effect CO2 fertilization, and it is an important way in which plants are our friends in helping to minimize the rise of CO2 in the atmosphere. You can see this effect in the graph below, which shows the theoretical relationship between the CO2 concentration in the atmosphere and the uptake of carbon from photosynthesis by land plants, summed up for the whole globe. This figure shows how the rate of photosynthesis increases as the concentration of CO2 in the atmosphere increases — this is known as the CO2-fertilization effect. But notice that at high concentrations (right hand side of the graph), the red curve flattens out, meaning that the photosynthesis rate does not increase forever — it has a limit. Hi, it's Mr. Andersen, and in this podcast I'm going to talk about photosynthesis. I love photosynthesis because it gives me two things that I need. I need to breathe, so it gives me oxygen. And I need to eat, and so, it's going to give me food. And so, I love photosynthesis. You might think it's only found in these things, plants. But it's also found in bacteria. It's found in algae, and so, it's found in protists, it is found everywhere. And so, photosynthesis has been around a long time, and it’s super important that you understand how it works. So, let's start with the site in eukaryotic cells of photosynthesis, and that's the chloroplast. So, this is a number of cells, and you can see how many chloroplasts we could have in a typical cell, so there's a whole bunch of them. There are a few terms you should be familiar with and where they are. First one is a thylakoid membrane. Thylakoid membrane is going to be organized like this, and basically, that's where the light reaction is going to take place. If you got a stack of thylakoids, like this together, we call that a granum. The other big thing to understand photosynthesis, is that this is filled with a liquid, and that liquid is called the stroma. That's going to be the site of the Calvin cycle. If we were to grind up a leaf, what we would find is that there's not only one pigment, chlorophyll A, that does photosynthesis, but there's a number of them that are working together. And so, if you grind up a leaf into some chromatography paper, and then you put it in a solvent, what you'll get is chromatography. It's going to separate into all its different parts. And so, this right here would be chlorophyll A, and chlorophyll B, and this would be like carotene and xanthophylls, and they're all working together. 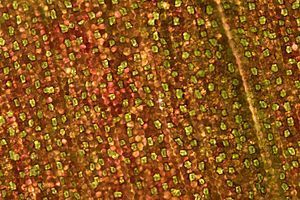 You'll see these other pigments in the fall when the chlorophyll moves back into the leaf and is reabsorbed, but if we look at what light they absorb, here's chlorophyll A and here's B, this is what's called their absorption spectrum, what color of light they're able to absorb. And you can see that they absorb a lot of the blue, a lot of the red, but they don't absorb a lot of this in the middle, this green. And so, a question could be, what is their least favorite color, plants - and the right answer would be green because they reflect that green light. Now, this has actually puzzled scientist for a long time, and we really don't have a definitive answer as to why plants are green. Know this, that if they were black, they probably would get a little bit too hot, they would absorb too much light. And so, let's start with an equation, because this is simply a chemical reaction. It's a chemical reaction with a number of steps. But what are the reactants? Water and carbon dioxide. And so, how does a plant grow? It's basically taking water in from its roots and it's taking carbon dioxide in through its leaves, through its stomata. The other thing it needs is light. And so, it's just taking these simple ingredients, and then it's weaving those together into glucose, this monster molecule here, and then oxygen. And so, this is the food that I get and this is the oxygen that I breathe. Now, are plants just nice? No. They're making this sugar for themselves so they can break it down using cellular respiration. And in fact, if I put this arrow in the other direction, that becomes cellular respiration. So, they're making food for themselves, and they're also going to make some of the structures. So, like the cellulose in the cell walls of a plant is made from that, as well. Okay, so, whenever I try to think what are the different steps in photosynthesis, I always imagine this picture right here. There's photo and synthesis in the word. Photo means “light” and synthesis means “to make”. And so, there are two steps in photosynthesis. The light reaction, and those are going to take place in the thylakoid membrane, and then the Calvin cycle. We used to call this the dark reactions, which is a silly term, doesn't happen during the dark, it happens during the light. And so, basically, the person who worked this all out is Melvin Calvin, and so, we named it after him. Where does this take place? You guessed it, it takes place in the stroma or this liquid portion. And so, let's kind of do a cartoon version of photosynthesis. What are the reactants again? Water, light and carbon dioxide. What are going to be the products that come out of this? It's going to be oxygen and glucose. So, let's watch what happens. In the light dependent reaction, water and light go into the thylakoid membrane, and they produce two things. They produce oxygen; oxygen is simply waste product. And then, they're going to produce these chemicals, NADPH and ATP, so they have energy now. Let's watch what happens to them. Well, the energy is going to transfer to the Calvin cycle, where carbon dioxide comes in and then glucose goes out. And so, this is the big picture of photosynthesis. But now, let's kind of dig in a little bit deeper and talk about the light reaction. Okay, so, where are we? We’re in the thylakoid membrane, so we're in this membrane right here. So, if we were to zoom into that membrane right here, that's what this diagram is. Okay, so, what are the two things coming in? Well, the first one is going to be light. So, light's coming in here, light's coming in here. What's the next thing that we're going to have coming in? And that's going to be water. Okay, so, let's look at some of the other big features in this thylakoid membrane. So, this is the outside of the stroma, and this is going to be the lumen, or the inside. And so, there's a couple of big things right here. What's in here? Well, these are basically going to be proteins with chlorophyll on the inside of it, and so, we call that whole thing together a photosystem. So, this first one is actually called photosystem 2 and then, we go to photosystem 1. And the reason we go backwards is that photosystem 1 was discovered first. So, basically, what comes in? Light. What's that light used to do? Well, that light is used to power the movement of an electron through an electron transport chain. So, that electron is going through proteins, carrier proteins, and eventually that electron is going to go to here. It's going to go to NADPH because, remember, that's one of the products of the light dependent reaction. Okay, what happens to the water then? So, the water is going to be split right away. If you split water, what do you get? Well, you get oxygen, so, that's the O2 that’s going to diffuse out of a cell and that's the oxygen that you're actually breathing right now. And then, we're going to have these protons, which are simply hydrogen ions, so, they're hydrogen atoms that have lost their electron. Okay, so, this is getting kind of messy, so, let's look what happens next. As that electron moves through the electron transport chain, and again, it's powered by the introduction of light here and light here, that electron is going to be moving all the way down here. And every time it goes through one of these proteins, it's pumping protons to the inside, so it's pumping protons to the inside. Now, protons have a positive charge, so, basically, what's happening is that you're building up a positive charge on the inside, so, there's a positive charge in here. If you know how cellular respiration works, you'll realize that this is the opposite of that. So, now, we have all these positive charges on the inside. Where do they go? Well, there's only one hole that they can go through, and that is to go through this protein here. As those protons move out, they're moving through a protein called ATP synthase, and it works almost like a little rotor, and every time a proton goes through, we make another ATP. So, what have we made in the light dependent reaction? We've made NADPH and we've made ATP. And what's nice about that is, they're now just sitting right here in the stroma and so, they're able to go on to the Calvin cycle, which is going to be the next step in this process. And so, who's providing the energy? Light. Who's providing the electrons? Water. And then, a base or a waste product to that is simply going to be oxygen. Okay, let's go to the Calvin cycle, then. So, what's happening in the Calvin cycle? You can see here's those reactants. So, we've got our ATP here, ATP here, and NADPH. What are they providing? Simply, energy. We also have this molecule here. It's called RUBP. Basically, it's a five carbon molecule. And then, we have carbon dioxide coming in. So, it moves through the stomata of the leaf and it's going to diffuse its way in. Carbon dioxide is a one carbon molecule, so, basically, there's an enzyme here called Rubisco and it's going to attach this one carbon molecule to a five carbon molecule. It immediately breaks into two, three carbon molecules and then it gets energy from ATP and NADPH. And when we're done, it's creating this chemical down here called G3P.What does G3P become? Well, it can be assembled quickly into glucose or sucrose or maltose or whatever they need to do, that's going to be produced right in here by the G3P. So, that's where we're synthesizing. In other words, we're taking carbon and we're fixing it. We're making it usable. Now, some of that G3P is released, but a lot of it is recycled again to make more of this RUBP, and so, that's why it's a cycle over and over again. What's the big picture? If we don't have ATP, if we don't have NADPH, then this process is going to shut down. What's the other thing that could shut it down? If we don't have carbon dioxide. Okay, so, that's basically photosynthesis, and again, it's been working for billions of years. But there's a slight problem, and that problem is called photorespiration. What is photorespiration? Well, photorespiration occurs only when we don't have enough carbon dioxide. So, if we don't have enough carbon dioxide (let me cross that out), well we certainly can't make our G3P, but something worse happens. Oxygen can actually jump into the Calvin cycle and using Rubisco, can form another chemical. Now, that chemical doesn't do anything. In other words, it has no purpose, and the cell actually has to break it down. And so, as a result of that, plants, and we call almost all plants C3 plants, and the reason we call them C3 plants is this G3P is going to be a three carbon molecule. So, these C3 plants, photorespiration is bad. In other words, they don't get anything out of it. And so, they're going to lose based on that oxygen kind of jumping into the Calvin cycle. And so, you might think, evolutionarily why would this have even evolved? Well, remember photosynthesis shows up first and then oxygen in the atmosphere shows up much later, and so, it wasn't a problem initially, but it became a problem. Another question you might think is, well, when are we not going to have enough carbon dioxide? When wouldn't we have carbon dioxide? Well, how do they get carbon dioxide? A plant is going to have a stomata, and it's surrounded by guard cells. So, basically, when a plant opens up its stomata, carbon dioxide can diffuse in. And so, the only time the plant wouldn't have carbon dioxide, because we have tons of carbon dioxide in the atmosphere, is when it's actually closed. And when would it be closed in a plant? The only time it's closed is when it's really, really hot, and a plant doesn't want to lose water, because through transpiration you're constantly losing water. And so, if you're a plant, if it's a hot day, you have this really tough choice. If you open up your stomata, you're going to lose water; you could shrivel up. If you close it, you can't get carbon dioxide in and then you're going to start doing photo respiration. And so, of course, nature has come up with solutions to this over time. And it's only going to be found in plants that live in a really hot environment. So, here's the first solution, and this totally makes sense. So, this is in CAM plants. CAM plants, an example would be a jade plant or like a pineapple. Basically, what they do is they only open their stomata at night. And so, at night, they open up their stomata and then the carbon dioxide will come in, and they'll create malic acid out of it. So, they're going to store it in vacuoles inside the cell. Okay, so now, when it's daytime, what they can do is they can close the stomata, because they don't want to lose water, and now, they can actually take that carbon dioxide out of the malic acid and they can use it in the Calvin cycle to make sugars. So, the great thing about a CAM plant is, again, they're only taking in carbon dioxide at night when it's cool. And then during the day, they can close their stomata and they don't lose water. Another example of this would be in C4 plants. What they do is, instead of doing it day and night, what they'll do is they'll take that carbon dioxide in and they'll actually use enzymes to make a four carbon molecule out of it. That four carbon molecule will move to some cells on the inside of the leaf, called the bundle sheath cells, and then they can simply introduce carbon dioxide into the Calvin cycle, here. And so, again, both of these solutions are basically taking in carbon dioxide when you can get it, creating a chemical out of it, and then they can introduce that chemical into the Calvin cycle, and they don't have to wait for carbon dioxide to diffuse in. Now, of course there's going to be extra steps in here. So, it's going to require more energy and so, we only see this in areas where it's really, really, warm. But an example of a C4 plant that we all eat and use a lot of, in fact most of us are just made out of this stuff, is corn. And so, that's photosynthesis. A simple problem is photorespiration, but I hope that's helpful. If the video does not play above, click here to be directed to the Photosynthesis video on YouTube .